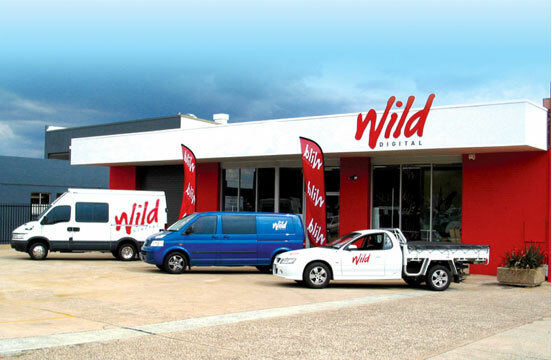 Wild Digital - About Us - Canberra Large Format Printers. Wild Digital is a 100% owned and operated Canberra business that has been providing Canberra and Australia with Digitally printed products for the past 20 years. Having started in small premises in the Tuggeranong Hypderdome, Wild headquarters now occupies an 800sqm premises at 99-101 Wollongong Street Fyshwick. When it comes to wide and large format digital printing few companies can boast a more extensive range of cutting edge technologies, production expertise, dedication and experience. We can print up to 1800mm wide and 3000mm long directly onto most rigid non-porous panels. Materials we can print on include foamex, corflute, acrylic and aluminium composite boards (dibond). Our flatbed printer uses UV stable inks that are suitable for indoor and outdoor use. If you need something larger we can do that too, it might just need more than one panel. We also print on flexible roll materials like vinyl, self adhesive vinyl, canvas and synthetic paper (yupo) up to 2000mm wide to 10 metres long. Wild Digital does more than just print in wide format, we develop and provide total display solutions for a large range of applications and industries. Whether you require graphic hoardings for your building, displays for a trade show or exquisite reproductions for your gallery exhibition we can help you. At Wild Digital we strive to be as environmentally friendly as possible. We use only the most environmentally friendly substrates available, most of which are either recycled or recyclable. We also investigate our suppliers to ensure they are environmentally conscious and employ recycling practices wherever possible. Yupo, the synthetic paper used in our rollups, is 100% recyclable and is made using no trees. Corflute, Foamex and Forex Smart which are all 100% recyclable. X-Board, a composite fibreboard, which is 100% recycled and 100% recyclable. Great care is taken to minimise material useage in order to reduce waste material. Any offcuts and un-used materials get collected for recycling so our waste turnover is very low. Printers are turned off when not in use other than for maintenance processes. Computers and other electrical equipment, including lighting are turned off when not in use. Low voltage flourescent tubes are in use throughout the business.